“Drunk Elephant” may seem like a pretty strange name for a skincare line. But it holds a special, if quirky, meaning for brand founder Tiffany Masterson. According to her, elephants love gobbling the fruit of the marula tree. Apparently, the fruit ferments in their tums and make them happy-drunk. Tiffany believes that virgin marula oil has all the goodness (anti-oxidants, fatty acid content, anti-microbial content), and it is a key ingredient in her skincare line that has become a staple on the shelves of smart beauty junkies. Based on the philosophy of “clean” skincare, Drunk Elephant formulas do not contain nasties that Tiffany (as well as many skin experts) believe are the root of inflamed skin: essential oils, drying alcohols, silicones, chemical screens, fragrance/dyes and SLS. 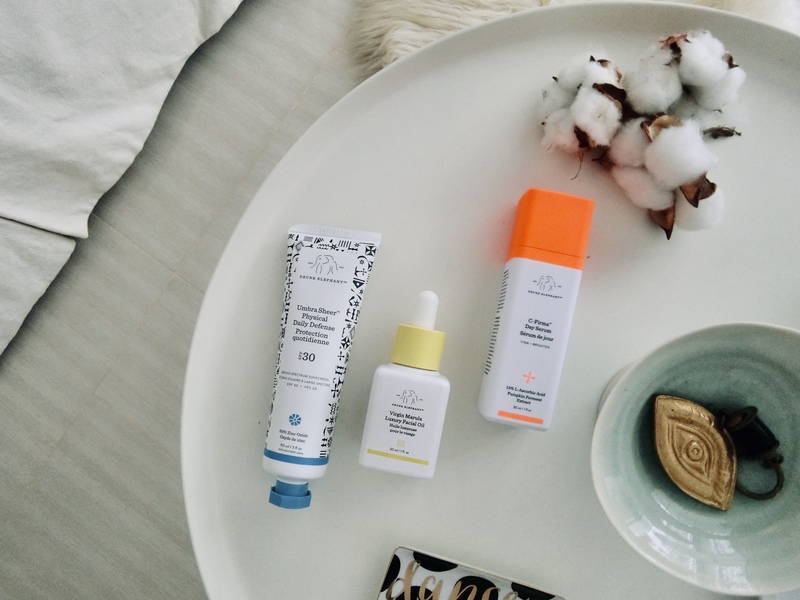 What Drunk Elephant formulas contain, however, put many other skincare brands to shame. For example, the potency of its popular C-Firma Day Serum is due to a blend of 15 per cent L-ascorbic acid and ferulic acid, 1 per cent Vitamin E, pumpkin ferment and pomegranate extract; grape, licorice root, Indian gooseberry as well as virgin marula oil. And a sodium hyaluronate cross-polymer. Once opened, it even has to be kept in a fridge to maintain its effectiveness. The rich formula sinks easily into the skin and adds and instant glow and hit of suppleness. I find that one pump is good enough for my combination skin. The Umbra Sheer Physical Daily Defense with SPF 30 comes out of the tube looking white and thick as with all physical suncreens. However, it is moisturising enough to blend beautifully without leaving any pastiness or stickiness behind. This award-winning product is made with zinc oxide 20 per cent; sunflower sprout extract for free-radical neutralisation, and anti-glycation, astaxanthin-rich algae extract and raspberry seed oil with antioxidant properties; raspberry seed oil; virgin marula oil; hydrating aloe vera leaf extract; and grape juice extract that reduces redness, and has anti-microbial and antioxidant properties. If you’re looking to kickstart 2019 with better skin, give Drunk Elephant a shot. Now available at Sephora stores.